The power of meditation mantras. The sages tell us that our essential nature is consciousness, truth and bliss, and that the source of our misery is separation from our essential nature. 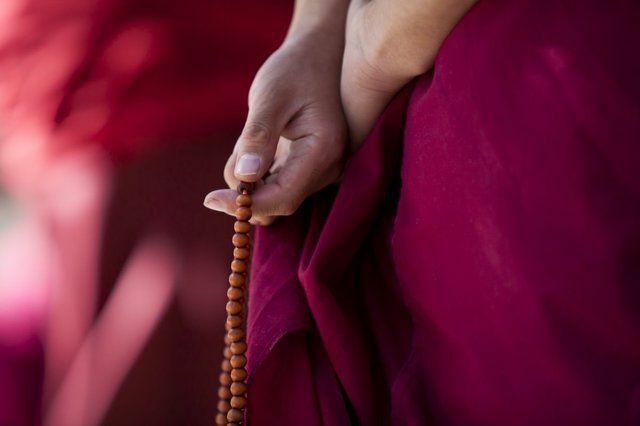 A mantra is a divine sound, a revealed word that has been experienced or received by the practitioner in the state of deep spiritual absorption (samadhi). It is a dense form of spiritual healing energy, the sound body of the Divine Being. It can also be thought of as a compact prayer. According to Ashley-Farrand, the word „mantra” comes from 2 Sanskrit words: „Manas”, which signifies „mind”, and trai”, which signifies „to free from”. Thus, the word mantra, in the literal sense, signifies „to free from the mind.” Mantras are potent vibration tools that can free your mind. There are 3 essential types of mantras: seed mantras (Bija), with form (Saguna), and without form (Nirguna). The Bija mantras can be used individually, but are usually incorporated into Saguna mantras to invest them with an important „seed” power. The Bija mantras correspond to the seven main chakras and to the main Hindu deities. The Saguna mantras request the forms of the individual deities or personalized aspects of God. It is considered that the chanting of the mantras with form gives rise to the actual form of the particular deity, hence, manifesting its power. Mantras have the power to vibrate energy at certain ranges and frequencies, and therefore to demagnetize the body. Sound travels 5 times more quickly through water than through air, and as the human body is composed of more than 70% water, it is therefore an excellent conductor for both vibration and sound. Chanting of a mantra is a easy way of keeping us in the present moment and stilling our „monkey mind”, which is forever jumping uncontrollably from one thought to another. This, in fact, is the goal of meditation and using mantras is a very effective way to accomplish it. It is a mantra, or vibration, that is traditionally recited at the starting and end of yoga sessions. It is made up of 3 Sanskrit letters, aa, au and ma which, when mixed together, make the sound Aum. It is considered to be the primordial sound (bija) of the world and to contain all other sounds. It is believed to be the sound of the universe. Chanting Aum mantra allows us to recognize our spiritual experience as a reflection of how the whole universe moves – the setting sun, the rising moon, the ebb and flow of the tides, the beating of our hearts. As we recite this mantra, it takes us for a ride on this universal movement, through our breath, our awareness, and our physical energy or prana, and we start to sense a bigger connection that is both soothing and uplifting. In Kundalini yoga, this soothing mantra meditation „Ajai Alai” is used to give you great strength to overcome any hindrances. It is supposed to lift you from anger and depression and is meant to be practiced whenever you need it. It means „I bow to Shiva.” Lord Shiva is the supreme reality, the inner Self. It is the name given to consciousness that dwells in all. Lord Shiva is the name of your true identity – your self. It has been said about this powerful mantra that if this mantra vibrates continually in your heart, then you have no need to perform austerities, to meditate, or to practice yoga. To chant this mantra you need no ceremonies or rituals, nor must you repeat it at an auspicious time or in a particular place. Chanting the sacred and ancient Moola Mantra is a great devotional act and of great benefit to the seeker of Enlightenment and Truth. The Moola mantra is a direct link to the Supreme Being, the living God and Creator of this Glorious Universe. Recite this mantra with intent and meaning. Allow the wellspring of love that arises within you to flow out into the world. This mantra will fill you with peace, love and joy. This can be literally translated into English: „I prostrate to the Liberator, Mother of all the Victorious Ones“. Recite one mala of this sacred mantra each night and each morning. Turn to Mother Tara when you feel depressed, when you feel a need of comfort or when you want some project to succeed. This pacifying mantra will lift your spirits instantly. This entry was posted in Buddhist Mantras on March 3, 2016 by admin.